Shacknews took a look at the latest from VR developer Survios. Does the boxing game punch above its weight? Our preview. 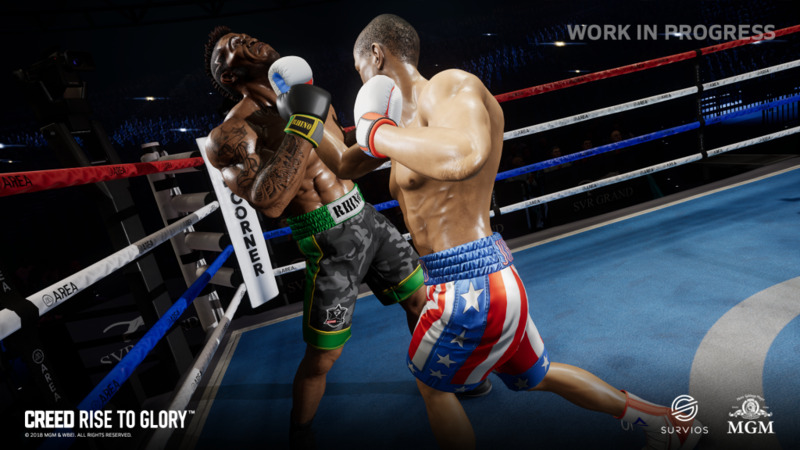 Survios made a big splash at GDC 2018 when they announced a partnership with MGM to bring the Rocky boxing franchise to virtual reality. The VR developer is known for past titles Sprint Vector and Raw Data and has always had a knack for unique gameplay mechanics. This is most definitely true in their latest title Creed: Rise to Glory. I tried out the demo at E3 Judges Week at the Sony event. After strapping on the PSVR, I went through some brief tutorials to get myself acquainted with the controls. Creed: Rise to Glory uses the PlayStation Move controllers in conjunction with the PS4 Camera to track your moves.The game's controls are super intuitive. Players can jab, cross, hook, and uppercut their opponent with similar ease to actually boxing. The game also rewards players who are able to block punches and wait for their perfect time to strike. There are certainly some gameplay mechanics that are truly unique to VR. When your opponent lands a solid punch on you, your character will remained stunned until you place your hands in the same manner as they appear on screen. Another new mechanic that is a callback to Survios' Sprint Vector game is called "Phantom Melee." If players are unfortunate enough to get knocked down, they are cast way outside the ring and have to swing their hands in similar motion as Sprint Vector to get back to their body before the countdown hits ten. This is a truly immersive way to capture the struggle of getting up that is a lot more innovative than mashing the A button in Punch Out. I was able to wreck my CPU opponent with ease after he got a few early licks in. At one point I was so immersed in the game that I accidentally ripped off the headphones I was wearing while blocking and proceeded to complete the demo without them on. Creed: Rise to Glory was definitely a solid workout, much like Sprint Vector, and it is awesome to see Survios bring such a beloved movie franchise (with some very special voice actors) to virtual reality. This VR title will certainly scratch the boxing itch for fans of the sport while remaining accessible and fun to folks who don't know Mike Tyson from Tyson Chicken Wings.